In honor of Forrest Gump’s birthday, I’m moderating a screening of the Best Picture of 1994 at the South Pasadena Public Library on Wednesday, October 22nd at 7p. The epic romantic-drama is based on the 1986 novel by Winston Groom. The motion picture was directed by Robert Zemeckis, and starred Tom Hanks, Robin Wright, Gary Sinise, and Sally Field. My Forgotten Hollywood Book Series ties Hollywood history with Americana in a Ken Burns-style. Forrest Gump is a similar cinematic triumph that includes the modern history of a generation known as baby-boomers in a neat package on screen as a fable of immense proportions that I refer to as a metaphoric Hollywood-and-Vine moment. During this magical evening, I’ll be autographing copies of my paperbacks. John Travolta was the original choice to play the title role, and he admits that declining the opportunity was a mistake. Bill Murray was also considered for the role. The author envisioned John Goodman playing Gump. The screenplay for a movie sequel was written in 2001. It is based on the original novel’s sequel, Gump and Co. that was written by Groom in 1995. 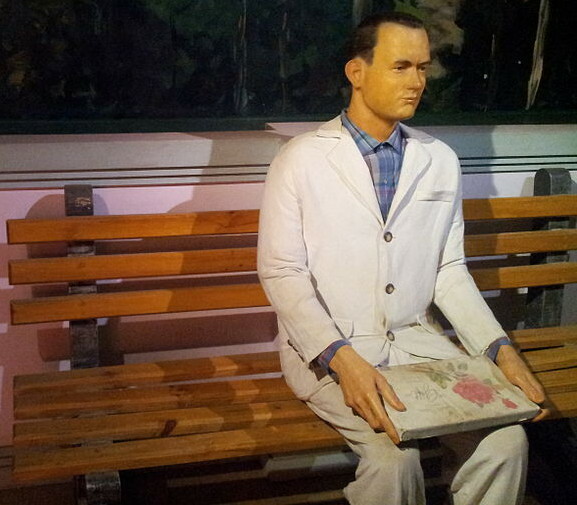 The script begins with Forrest sitting on a bus bench waiting for his son to return from school. After the September 11 attacks, Zemeckis, and Hanks decided the story was no longer relevant. By the way, during the course of the second novel, Gump meets Tom Hanks, attends a release of the original flick, goes on The David Letterman Show, and attends the 1995 Academy Awards. This promised to be quite a wacky movie experience. The South Pasadena Public Library Community Room is located at 1115 El Centro St., in South Pasadena, CA. Bring your box of chocolates… or popcorn… and enjoy this family-friendly event. This entry was posted on Sunday, October 19th, 2014 at 11:20 pm	and is filed under Blog by Manny Pacheco. You can follow any comments to this post through the RSS 2.0 feed. Responses are currently closed, but you can trackback from your own site.